Journalist Catherine Garcia of NBC San Diego has covered the problems cited by Elias in which prosecutors withheld evidence that showed fingerprints did not match the accused. Prosecutors say they have no obligation to disclose the existence of inconclusive fingerprint comparisons. Judge Elias did not agree. In a recent bicycle theft trial, in which the defense argued the verdict should be overturned because of problems with discover, Judge Harry Elias criticized the prosecutors’ handling of fingerprint evidence and said the DA’s office has a bad reputation among some defense attorneys, and other judges. Judge Elias made a quick and very forceful decision at a hearing this week. He said he’s done absolutely nothing wrong, and will stay on the case. This isn’t the first time San Diego law enforcement has hidden evidence that cast doubt on the guilt of the accused. Another boycotted jurist, Judge John Einhorn, in 2008 was confronted with the “discovery” that new testing on the dead body of Todd Sommer who was supposedly killed by his wife via arsenic poison, a crime for which she was convicted, showed there was no arsenic present. Over the past year, Einhorn has been at the center of two of the higher profile cases in San Diego. Sommer was convicted of murdering her husband, Todd, in 2007 by poisoning him with arsenic. She was granted a new trial in November of that year. Then in April 2008, new evidence was discovered — tissue samples of Todd Sommer that showed no traces of arsenic — and that led to prosecutors dismissing the case. The retrial had been assigned to Einhorn. Allen Bloom, Sommer’s lawyer, pressed for the case to be dismissed in a way that would preclude prosecutors from ever charging Sommer again. The veteran judge said at the time that the reputation in the courthouse of the prosecutor’s office was “not good,” largely because of several other cases in Vista in which evidence that should have been given to the defense was not. Elias said some judges believe those to be “deliberate and intentional” omissions, which the District Attorney’s Office vigorously disputes. The dispute erupted after Bowles’ conviction for burglary and theft. During a second, shorter trial to prove that Bowles had committed two previous “strike” offenses that would increase his sentence, defense attorney Sherry Stone contended that a forensic analysis of a single fingerprint on a pawnshop slip had not been disclosed. Analysis of the print showed that it was inconclusive and could not be linked to Bowles. Numerous other prints on evidence, however, were connected to him and included in a written report. The defense contends that omitting information of the inconclusive print from a report on the fingerprints was wrong. Prosecutors say the information was included in a different exhibit and that there was no obligation to say so in the report on all the prints. Writer Kelly Thornton of the Voice of San Diego recently published an article on what Dumanis & Company are trying to do to local judges who don’t do what they want. It is considered unethical for a party in a pending case to have communications with the judge without the other parties present. Although the prosecutor and Parsky had no direct communication in this case, Parsky was so concerned about the implications of the exchange that she consulted a state judicial ethics panel and was advised to formally disclose it. She did so at the next hearing in the domestic violence case of defendant Michael Barron. “The supervising attorney from the District Attorney’s Office … advised the supervising judge that the district attorney’s office may be exercising peremptory challenges against me based on that ruling and others,” Parsky said, referring in part to decisions in the Barron case. For months now, an unexplained edict from District Attorney Bonnie Dumanis has forbidden county prosecutors from bringing new criminal cases before one particular Superior Court judge. What gives? Can the DA just wave her hands and — voila! — a judge is blackballed? Yes. It’s that simple, and it’s apparently been done before here. But there are risks to boycotting a judge, and one expert suspects that Dumanis won’t play this card for long. “I don’t think the office can afford to waste this free challenge in every single case,” said Jan Stiglitz, co-director of the California Innocence Project. He’s referring to what he calls a “freebie” — the opportunity for a prosecutor or defense attorney to reject a judge in a criminal case without specifying a reason. It’s known as a peremptory challenge. 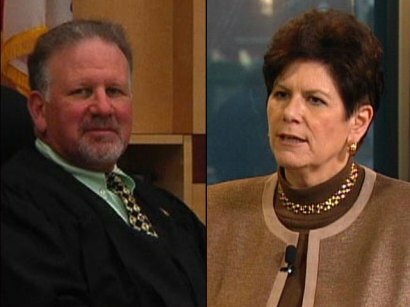 Judge Elias may be targeted for more boycotting by Bonnie Dumanis. He’s dared to throw out the trial of Kenneth Bowles because he believes the prosecution willfully and intentionally withheld exculpatory evidence. In a 15-page ruling, Elias concluded that evidence of an inconclusive fingerprint match on a pawnshop slip that was part of the evidence against Bowles should have been given to defense attorneys. Bowles had argued he was at a different pawnshop at the time the bicycle was taken. But prosecutors tied Bowles to the theft of the bike, relying in part on the pawn slip with the fingerprint that was determined to be inconclusive, Elias noted. The case caused a stir in the courthouse because defense attorneys say it is an instance of failure to disclose key evidence, which has happened on several occasions. Elias did not dismiss the case entirely, concluding that other evidence linking Bowles to the crime was strong enough that he probably would have been convicted. He also let one guilty verdict stand. But Elias was not willing to excuse what he said was “willful omission of exculpatory evidence” that could have been favorable to Bowles’ defense. As a further penalty, he said prosecutors could not use the pawn slip as evidence in the retrial. While most citizens would like to see criminals punished appropriately, what Bonnie Dumanis and San Diego prosecutors are doing amounts to perverting justice and denying a fair trial to accused parties. The government already has huge advantages over anybody it accuses of a crime. It has nearly unlimited resources to fabricate, plant, and alter evidence. It can also hide evidence that doesn’t support accusations. Defendants deserve access to all of the real evidence, but they are not getting it due to prosecutorial misconduct. It appears Bonnie Dumanis and her cohorts deny access to evidence because they believe that a “win” for the prosecution is more important than a fair trial and justice being served. In doing so and by then whitewashing these problems, Bonnie Dumanis has shown her true character and revealed that she’s not a suitable person to be heading the San Diego District Attorney’s office. The public would do well to remember that when considering whether to vote for her again. Ok, so she totally blew it on the Cynthia Somers case.. Praise God an innocent woman was finally set free and her name was cleared. Bonnie Dumanis and her office prosecuted my – rightly so and I’m thankful she did. Changed my life for the better from then on! Which case would that be? Oh, mine wasn’t high profile- but if I had gotten away with a misdemeanor DUI and Under the Influence charge – it probably could have been someday. However I won’t be ever again! The worst part of this is the obvious violations of free speech as Facebook will not let this article be shared in any way. San Diego–wake up. Dumanis is a tyrant. And I voted for her. The larger problem is that she’s selected from a very mediocre class of lawyer trained in the DA’s office to throw people in jail, and these guys work together like a pack of incompetent, but powerful (because we give them the power), feral dogs. Throw her out and hire a top lawyer in San Diego–It was said that early Americans had to “drag Washington from the plow.” In other words, anyone who wants the job (DA prosecutors) don’t deserve it. It’s the >least< we should do for the world's finest city. San Diego Judges — if Dumanis or her bonehead minions attempt this against your colleagues blackball >her.< very carefully and go after those who defy the public good. Thank You for being apart of the change in my life? 1) False politically motivated prosecution of Steve Castaneda to help Bonnie’s friend Cheryl Cox win the Chula Vista mayoral race. Her husband Greg Cox is another of the many FOBs (Friends of Bonnie) who corrupt our county. 2) Ignoring former county employee Patricia Gregory’s theft of over $100,000 from her clients. Dumanis was forced to prosecute by the Union Tribute expose of her ignoring the crimes. Now Bonnie wants to be San Diego Mayor. She has spread corruption all over the county. Anybody who votes for her is either stupid or a corrupt FOB. Join the Facebook page of San Diegans who want Bonnie Dumanis out of office.